From exclusive indoor water features to the use of reclaimed wood, summer hot design trends are a blend of the trendy and the timeless. Is your living space dressed up for the hot summer days? If it is still not, but you plan to lend your home a breezy summer look, then find inspiration and ideas from the hottest design trends. Actually, you have a number of options to choose from. 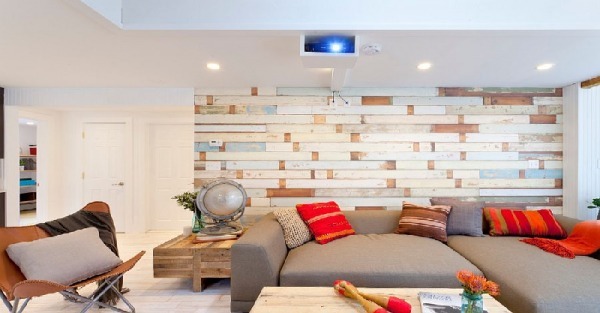 Incorporating indoor water features, reclaimed wood, or pastels and watercolors are definitely attractive solutions. However, it you want to stick to something classic, opt for the tried and tested beach style. When it comes to decorating the home with the cheerfulness of summer, nothing matches this simple style that can work well all year round with minor changes. 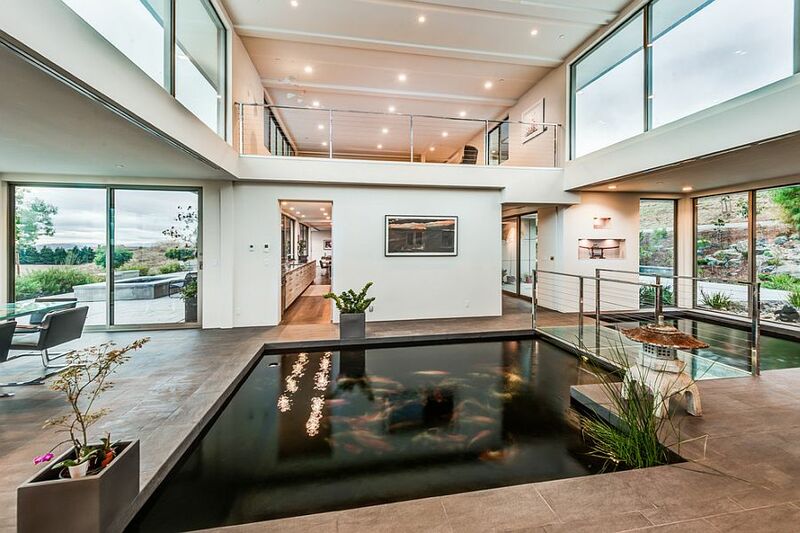 Contemporary designers add captivating water features to elegant interiors. As they bring a sense of tranquility and balance of elements, these mesmerizing beauties are much more than an esthetic addition. 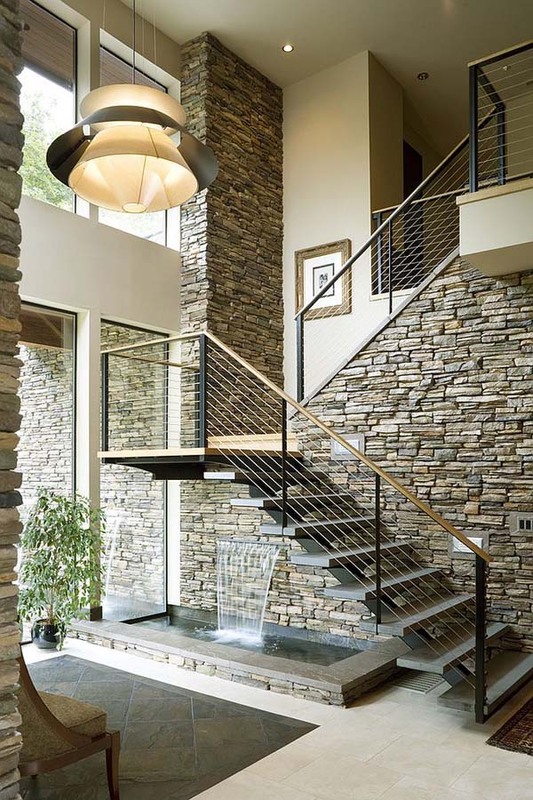 In the picture above, a magnificent contemporary staircase is complemented by a waterfall. Definitely a fascinating space, don’t you think? Unquestionably, any indoor water feature instantly becomes a ravishing focal point. Furthermore, when used properly, it can also help cut down on artificial cooling needs. This small koi pond with a walkway above is another stunning option to add a water feature to an existing home. The movement towards more planet-friendly interiors presented with indoor living walls and herb gardens continues with the newfound love for all things crafted in ‘reclaimed wood’. 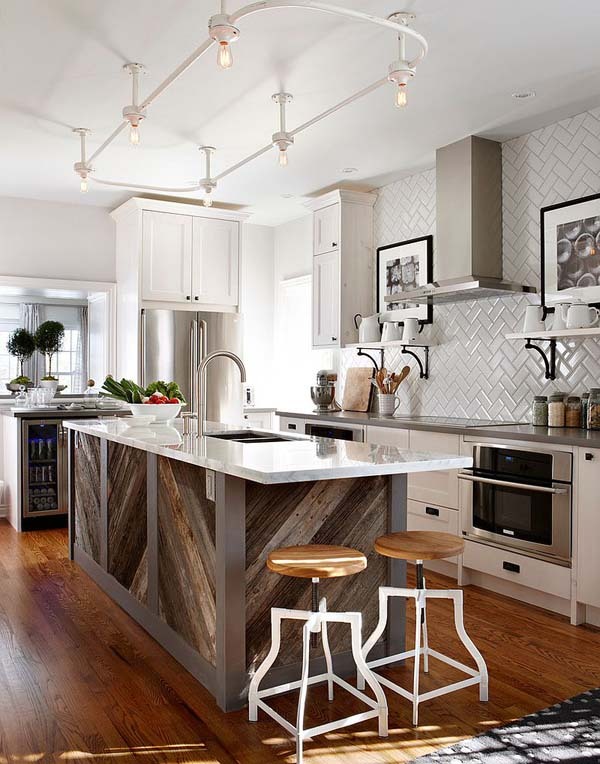 Whether used as an accent wall, gorgeous kitchen island, eye-grabbing custom-craft coffee table, or barn-style doors, incorporating reclaimed wood is currently a hot design trend. The unique kitchen island shown above adds warmth, visual interest, and personality to this fabulous kitchen. Moreover, with ‘adaptive reuse’ becoming a focal point in contemporary architecture, the use of reclaimed timber is expected to only go up in the coming months and years. In addition to its green credentials, reclaimed wood also provides a wonderful cost-cutting option that reduces wastage both in terms of material and expenses. When it comes to decorating the home with summer cheerfulness, nothing matches the tried and tested beach style. 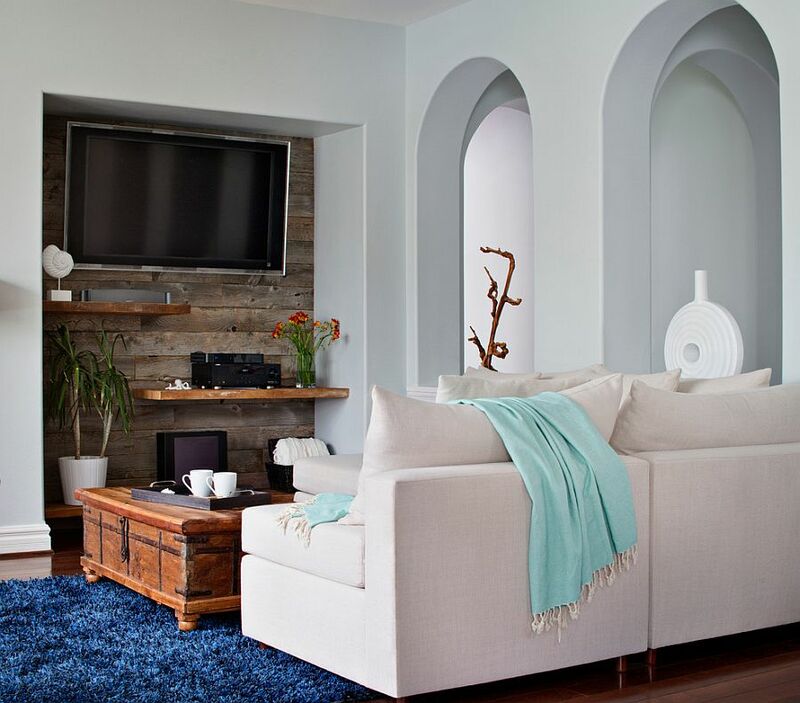 Furthermore, with some minor tweaks, beach style works well all year long, just combine your favorite colors with touches of blue, turquoise, and coral to create a chic, soothing and bright setting. In the picture above, splashes of blue against a background of sandy shades create a striking beach-style space. As pastels dominate the spring/summer collections, borrow from the world of glitz and glamour and incorporate some dreamy pastels in your interior. When used right, pastels work well in almost all settings. However, if candy pink seems too sweet, opt for shades like minty green that work well in rooms with themes ranging from modern to retro and midcentury. Actually, watercolors unleash the breezy charm of summer. 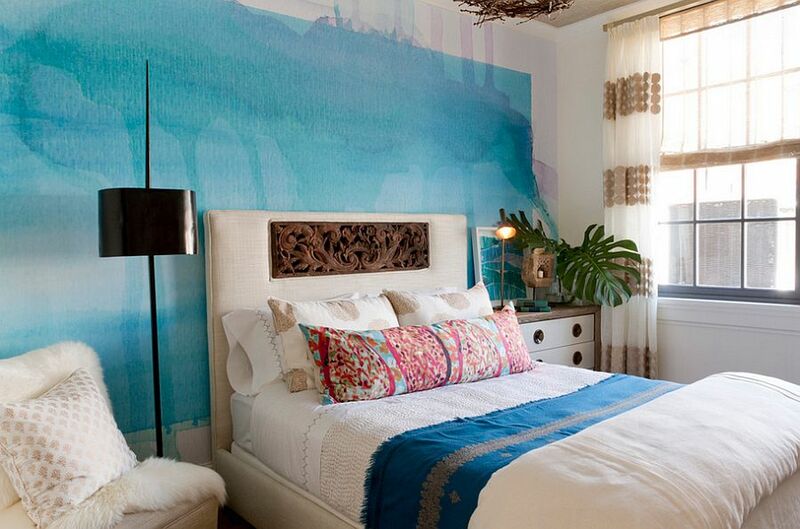 In the above-shown picture, a watercolor-inspired accent wall adds character to this lovely bedroom. The watercolor decorating trend is gaining popularity across the globe and it is definitely the right time to use it in your living space.